The ingredients list may look a bit complex but the majority of the ingredients are store cupboard staples. If you marinade the chicken the night before this makes a great, quick, easy and healthy tea for the whole family. On eating this recipe my OH declared that it was now in his (constantly changing!!) ‘top 5’ list of my recipes and they he would rather have this than a takeaway. Considering he isn’t on a diet, this is a result!! Caution – this recipe contains nuts! In a large mixing bowl add the lime zest and juice, brown sugar, soy sauce, curry powder, cumin, ground coriander, salt, peanut butter, and sweet chilli sauce. Add 150ml cold water and whisk to combine into a nice smooth sauce. If the sauce is still a little thick, add a little more water. Tip half the sauce into a small bowl and pop to one side. Take the onion, garlic and ginger and blend until it forms a paste. Put half this mixture in the large mixing bowl and then add the chicken, combining so the chicken is well coated. Cover the chicken and pop in the fridge to marinade (around 1 hour should do it but you can leave it overnight, I’ve only left it 20 minutes or so and it was still lovely!). Take 4 bamboo skewers and soak in cold water (this is so they don’t burn while the chicken is cooking). Then take a small sauce pan, add the other half of the onion puree and fry in 1kal for a few minutes. Then add the rest of the sauce that you reserved in the small bowl, turn the heat down to low and simmer so the sauce warms and thickens. Add the crushed chillies if you are having them at this point. Add a little water here and there to get the sauce to the consistency you like, I like it quite thick. When you are ready to cook, construct the kebabs by layering a cube of each vegetable followed by a chunk of chicken. I had around six chunks of chicken on each skewer but yours will depend on how big you cut the chicken. Season and then pop under the grill for 18-20 minutes, turning regularly until cooked through and a little charred. 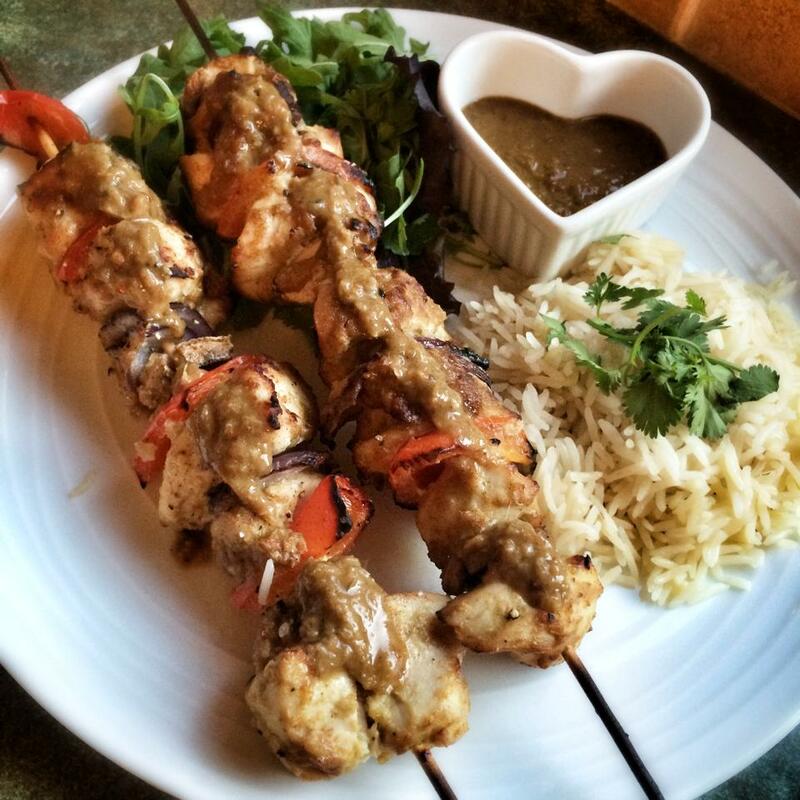 Pop onto a plate and top each kebab with a little of the warm sauce and a drizzle of lime. Pop any remaining sauce in a little bowl for dipping. Serve with anything you fancy, I did a small portion of basmati rice and a coriander salad. Amazing! Also delicious cold with salad the following day! Wow, wow ,wow. My husband and I just had these for dinner with brown rice and coleslaw. Really wonderful flavours. I used chicken thighs cut into chunks as they always stay juicy. I cooked some as kebabs with veg and some just in the oven on a tray with frylyte spray on foil. We loved both and will use the cooked bits tomorrow in thins with salad……can’t wait. Oh my goodness! I made an amended version of this for dinner tonight and it was AMAZING! I put chunks of chicken, onion, red pepper and mushrooms in the slow cooker and then added all the other ingredients as the sauce. Absolutely delicious and I will definitely be making it again! Hello, this looks scummy! Would it be possible to use the powered peanut butter instead and if so do you know how much?